As I mentioned, the menu is marked with symbols to indicate gluten-free dishes. When I let the wait staff know, they were understanding of the nuances of accommodating a gluten-free diet. Vegetarian options are marked as well, but not other allergies so you will have to cross check with the staff if you have more questions. As a starter, I ordered the summer roles, which were arranged beautifully when they came to my table. 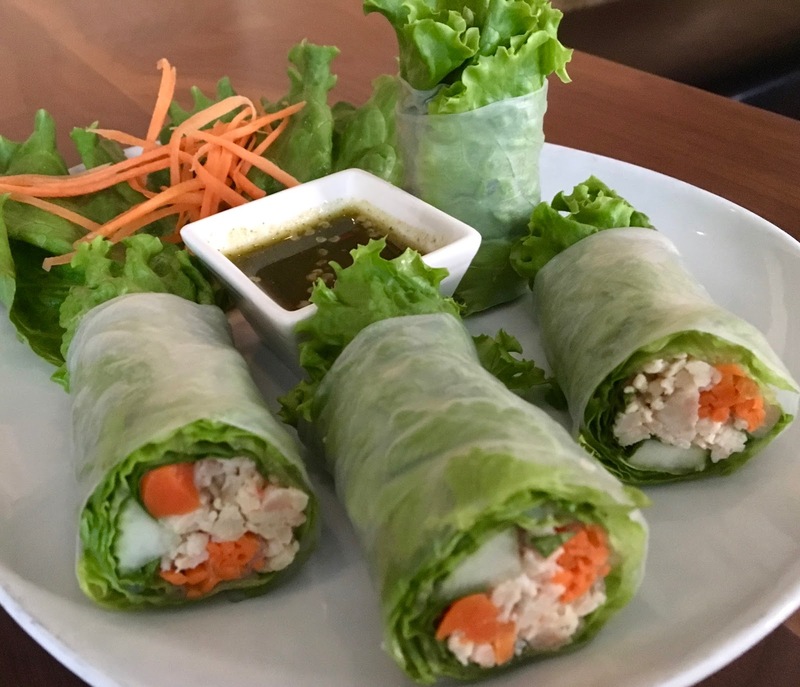 These minced shrimp and chicken rolls also included carrots, cucumber and basil in a lettuce wrap coated with rice paper. The flavors of the roll were bright and delicious, highlighted by the thai basil. I like how the rolls were stuffed but held together nicely. For those looking for flavor without any spice, these are a great way to start the meal. For my entree, I chose the green curry, which is my typical go-to Thai dish when trying a restaurant the first time. Like the summer rolls, I liked the presentation of the food, on a beautiful blue and white bowl. The curry is soup-like and the creamy "broth" has notes of lemongrass, lime, and potent Thai basil. 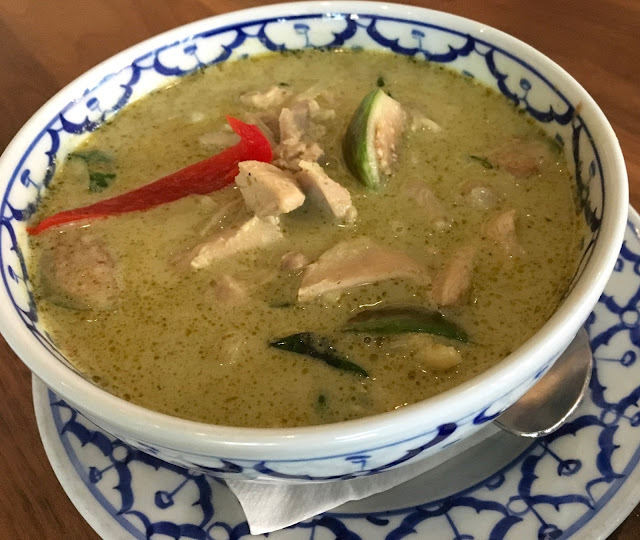 I liked that the green curry was spicy and packed a punch, but wasn't overpowering the fragrant flavor of the ingredients. Chicken, eggplant, and bamboo were cooked to ideal tenderness, and were in good proportion. The portioning of the curry was quite generous, and I enjoyed having leftovers to take home. I asked to substitute brown rice for the standard jasmine rice. 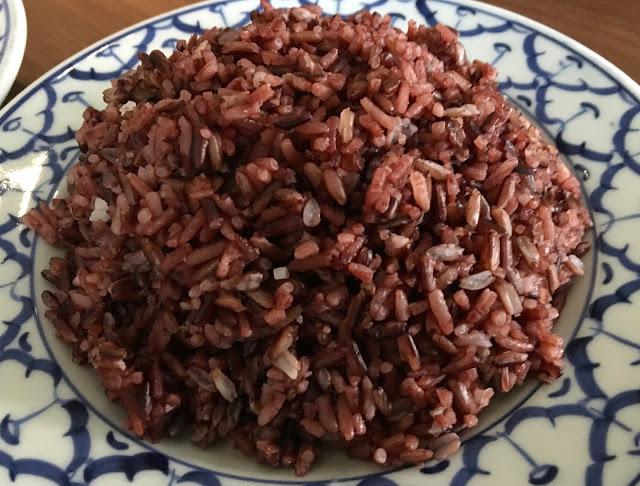 This rice is purplish in coloring, and has a beautiful nutty taste. While rice at any restaurant is more often than not dry and flavorless, this rice was moist and had a wonderful flavor that added complexity when stirred into the curry. 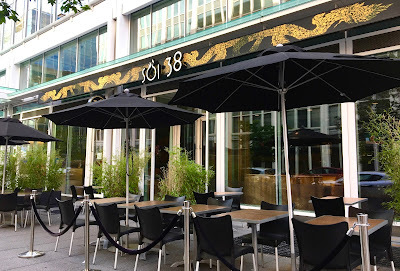 I left impressed by Soi 38, both by the excellence of their food and the attentiveness of their wait staff. I felt like they really cared about my experience, and were always checking in to make sure everything was okay. With lots of gluten-free options, I will definitely be back to give them another try, and look forward to exploring around the menu. With a beautiful interior and gluten-free awareness, Soi 38 is definitely a restaurant to take note of when in the Foggy Bottom neighborhood. Special Feature: Make reservations online through Open Table.